One thing I despise is trolls on the internet. 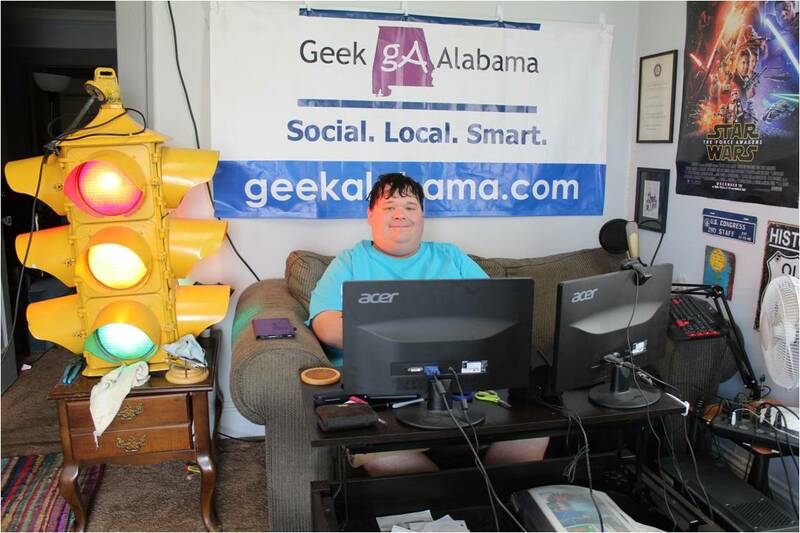 I have had my share of trolls on Geek Alabama and on social media. Numerous trolls and haters complained about the coverage of Pigskin Roundup last fall. And several trolls have come on this blog and complained about everything. This is why I approve all comments before they go live on this blog. After the last severe weather event in Alabama last Monday. The trolls have come back up from the underground and have taken the internet complaints by storm. Here is a video from me showing the high winds and dime size hail here in Anniston on Monday. All North Alabama counties experienced a widespread wind storm and large hail event on Monday. I started warning everyone on Facebook and Twitter around noon Monday. 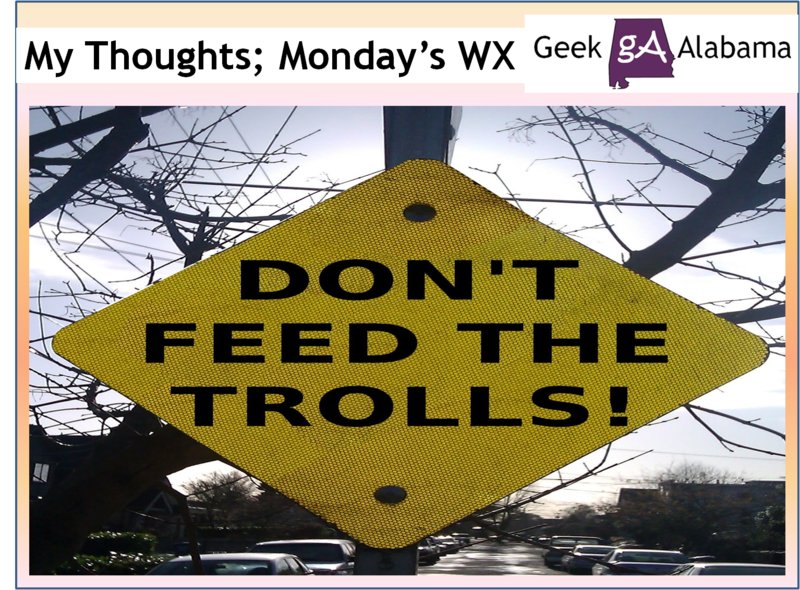 I kept everyone up to date with the latest warnings and information through Monday night. After it was over and I had a little time to eat and catch a break. Over 220,000 people in Alabama were without power. Many trees were down and there were lots of structural damage. And around 20 people were injured. Thank God no one was seriously hurt or killed! All of the weather people at the TV stations are getting many complaints about the lack of warnings and interruptions of their favorite TV shows. My feelings is no one should be complaining about not getting the warnings for these storms. The National Weather Service was warning about these storms all afternoon long! If you were paying attention, these storms entered NW Alabama during the midday hours. You had several hours to be ready for these storms. I warned people about these storms on my Facebook and Twitter pages. And the Pigskin Roundup and Geek Alabama Facebook pages as well. Which automatically post to their Twitter pages! Sure, the local media here in East Alabama like TV 24 and the Anniston Star could have done a better job with the severe weather coverage. I was the only one doing multiple weather updates during the severe weather event in East Alabama. I was also passing along information from West Georgia Weather and Northwest Georgia Severe Weather Team. Don’t believe me, here is another screenshot from my Facebook page. One suggestion I would make is I would like to see TV 24 create a Facebook, Twitter, and Google + pages all about weather. All of the other TV stations in Alabama do this. I think this would help get the warnings out better. Many people today have smart phones and check their social media accounts often! I would also suggest some improvements to the TV 24 and Pigskin Roundup social media pages but that is for another post. 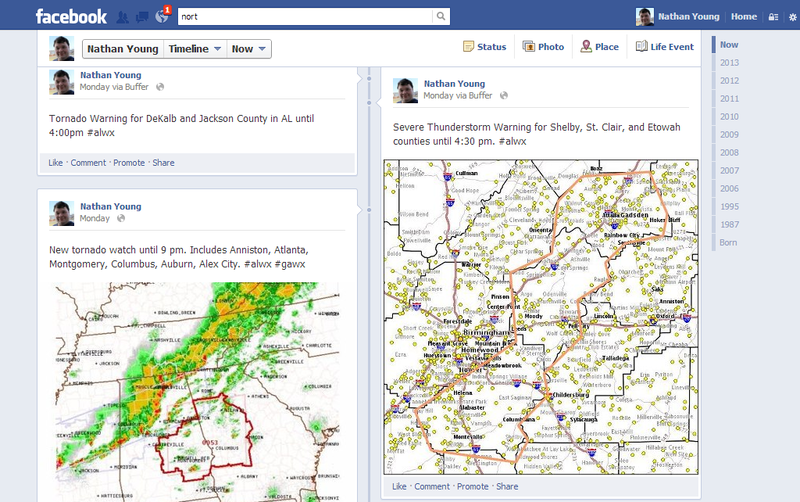 There is a huge lack of real-time weather information in the East Alabama community that is not coming from Birmingham. And that has got to change! My next thought is about you the people. Me, the NWS, and the TV meteorologists can put out all the warnings in the world. But if you don’t pay attention to them, you put your life at risk during severe weather events! You must have a way to warn yourself of upcoming severe weather. Every household should have a NOAA weather radio. And if you have a cell phone or smart phone, you need to receive weather warnings! For cell phone users; Baron Services offers Alabama SAF-T-NET. You receive severe weather warnings for FREE! For smart phone users; you can get the iMap Weather Radio app for a low-cost! To end this post, I also wanted to talk about the people complaining about the TV show interruptions and the people complaining about Alabama Power. On James Spann’s post, people were complaining about Mr. Spann interrupting The Dr. Oz Show. Really; Dr. Oz is a great show to watch during good weather. But during times of severe weather, I would rather get weather information. By the way, did you know that ABC 33/40 repeats The Dr. Oz Show at 12:07 am? And for the folks complaining about the lack of electricity. Have you thought about getting a generator for your home? After every weather disaster, we hear the same complaints from people lacking power. Here’s a great solution, I wish it was Alabama law that every home had to have a generator! A representative from Alabama Power said during a chamber function that the East Alabama region experienced bigger power outages from this storm than during the April 27th tornado disasters and Hurricane Opal. If you don’t have a generator and need electricity. Have you thought about going to a shelter or to a hotel? It’s supposed to get very cold tonight, guess what? The power workers will be out during the cold tonight restoring power. They are away from their families and working 18 hours at a time to get your power back on. They are great people in my books!